However, if it rains or the weather is poor then we will sit in the lower deck. 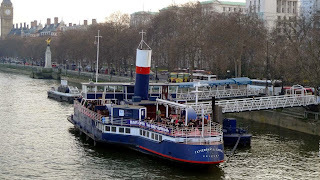 We will leave the boat at 5pm and in the evening, we will sit on the grassy areas on the South Bank of the river Thames beside the London Eye and listen to the live music and watch the firework display over the Thames. There are food stalls all around and we can sit on the grass and eat/drink. Single rooms are only £45 per night because it is University of London Student's accommodation.